Cobaea scandens is commonly known as the ‘Cathedral Bells Vine’ as well as the ‘Cup and Saucer Vine’. This is a fast growing long flowering evergreen climbing plant native to tropical central America. With attractive cup shaped flowers Cobaea scandens is a great plant for a sunny position. C. scandens alba has (see picture right) white to green flowers. Cobaea scandens require a sunny to part shaded position and a humus rich moist well drained soil. Fairly easy to grow from seeds avoid frosts where possible. In warm climates treated as a perennial in cooler areas, New South Wale, Victoria it is grown as an annual. We suggest a humus rich soil with the plant mulched well to maintain a cool moist root run. Cobaea scandens – Summary Information. Height – This is climbing plant that will reach 3 – 4 metres. Flowers – Purple or pale green to white depending on variety. Flowering period – Spring to summer in cooler climates. Spring through summer into autumn in warmer areas. Frost tolerant – It will be burnt back by frosts, however recovers well. 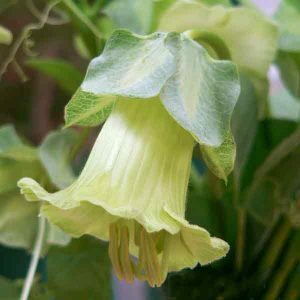 Cobaea scandens is available fro sale from the following participating nurseries.